Martha Stewart Living Omnimedia and KB Home celebrated the one year anniversary of their KB Home Stapleton community yesterday. Martha attended the birthday celebration with Jeffrey Mezger, president and CEO of KB Home. Located just outside Denver, the community opened last year and is the only KB Home/Martha Stewart community in Colorado. Approximately 100 contest winners, along with media and numerous local officials, attended the birthday party held at the community. Attendees enjoyed a luncheon and had the opportunity to participate in a cupcake-decorating contest judged by Martha, who selected the winner; Robert Davies used icing for a big M and her trademark line: "It's a good thing." Davies, who bought one of her homes at Stapleton, confessed it was his first attempt at decorating a cupcake. And when he told her he is a psychiatrist, she quipped that it's a long drive back to the airport, and maybe he should ride along. He and two other runners up were presented with gift baskets courtesy of Martha Stewart Living and KB Home. Martha and Robert Davies, the winner of the cupcake contest. According to MetroStudies, the year to date sales at the KB Home Martha Stewart Stapleton community are 38 percent higher than the other 11 builders in the Stapleton master plan. Martha poses with KB Home President and CEO Jeffrey Mezger in one of the model homes in Stapleton. At KB Home Stapleton: Homes Created with Martha Stewart, homebuyers have their choice of five floor plans ranging in size from 1,593 to 2,084 square feet, all with 3 bedrooms, 2.5 baths and 2-car garages. 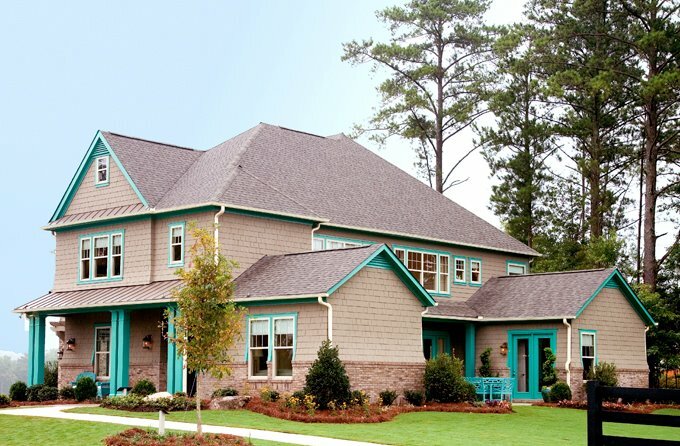 The exterior of the homes are inspired by Martha’s own residences, as are the interior design details such as wainscoting, picture-frame moldings, open shelving, beadboard and more. Visitors to the community can tour three model homes decorated by the Martha Stewart design team. Pricing on your very own Martha-inspired home begins in the mid $300,000s. The largest of the Lily Pond Lane plans. "I am thrilled that our KB Home Martha Stewart community in Stapleton is one of the best selling in Colorado,” said Martha. “These homes demonstrate the excellent design and value we know is important to our customers." Martha also told reporters that she will be supporting Obama this fall (by default, since she is a Democrat who was an adamant Hillary supporter) but that she will not be at the Democratic convention since she will be in Mexico filming a segment for her TV show. Martha also hinted that one of the main goals this year is to make the TV show an international hit. I think KB Home and MSLO should focus on developing new urbanist communities like Stapleton and not add to the rather depressing suburban sprawl across North America. Yes, Will, that WOULD be nice!